We’ve talked before about analyzing split format events, and the inherent dangers present in mis-evaluating information based on possibly flawed data. Normally this would be a pretty big deal—were we looking to trendspot or game the meta, we’d be very interested in ephemeral topics like public perception, targeting, and other concepts. Today, I figured we’d dodge this conversation (as it tends to get pretty thick and technical) and focus instead on decklists. As free individuals exercising our ability to think and do what we want, nobody is telling us what to do with certain information that is presented to us. Sometimes (read: most times) it’s best to approach events in as formulaic and scientific a way as possible—you know, so we look smart, feel powerful, and can lord our superior knowledge over all our friends even when we 0-2 drop. Joking aside, approaching data analysis from a top-down position can give clarity to the chaos that results from pure speculation based on only morsels of information. However, chasing this white rabbit can often lead us down the wrong path based on incorrect initial assumptions, which can cause us to make grave errors like playing Jund in a field full of Eldrazi, or Grixis Delver in a field full of Burn. Instead, let’s just look at some lists and pull some takeaways from them, separate from metagame speculation. This list is relatively standard fare for Jund, but the three copies of Grim Flayer alongside both Dark Confidant and Scavenging Ooze (and Goyf of course) is fairly aggressive, at least for someone not familiar with recent Jund iterations in Modern. Grim Flayer is a fine card on rate alone—it’s by no means a powerhouse, but does just enough to be worth considering alongside Scavenging Ooze in certain metagames. When we’re hitting, we can ensure we’re only topdecking good stuff, but for the most part the “scry” effect is pretty win-more. If Jund is swinging, sure, sometimes we’re in a position where we need to topdeck action to keep up, but for the most part this guy is either a two mana 4/4 or…well…dead. The fact that these Jund decks aren’t packing Seal of Fire is interesting to me, especially in such an aggressive field. I know we don’t want it against Dredge or other combo decks, but against all the linear strategies a free removal spell is quite nice, especially when it’s pumping our delirium or Tarmogoyf, and giving us a free kill the turn we play Liliana of the Veil or Kalitas, Traitor of Ghet. I’ve long been a fan of Slaughter Pact in Kalitas Jund lists (specifically in creature-heavy metagames) but the tempo loss that comes from paying three to kill a creature is often too much to ask for a removal spell in a Twin-less format. Sad. I’ll be honest, the main reason I’m mentioning this deck is because Todd’s list is a perfect example of how good Spell Pierce is out of the board of Infect against Jund. It makes sense, as everything they have that isn’t a creature is killing our creatures, and they work their way up the curve, so Spell Pierce would have to be solid, right? But it’s not until we see that Jund is now upping their Anger of the Gods count, and playing things like Night of Souls’ Betrayal, that we start to recognize exactly how strong Spell Pierce is. Remember, Infect lists are playing fewer Apostle’s Blessing now in favor of Blossoming Defense, which does nothing to protect us against an Anger of the Gods (excluding scenarios where Pendelhaven is a factor). Anger of the Gods in large numbers out of Jund has turned a matchup that was slightly unfavorable decidedly more so, especially when we’re seeing Grim Flayer make an appearance to put on a quick clock. As the Infect player, I’m still ahead in the matchup in games played, even though I’m sure I’m at a disadvantage and probably getting a little lucky. Spell Pierce is the hero to which I owe my success. Next up, we have a deck that’s been making the rounds more and more, partly butressed by the new enemy-colored fastlands from Kaladesh. While Zack Kanner didn’t fare as well as Anderson in the event overall, he still posted a 7-1 record in the Modern portion. This new breed of Jeskai Aggro takes advantage of playsets of both Inspiring Vantage and Spirebluff Canal to play firmly three colors in an aggressive deck, without giving up free life points to opponents due to self-inflicted damage. Our relatively high creature count pushes us away from Delver of Secrets, which in turn lets us cut do-nothing spells like Thought Scour and Serum Visions. Instead, we’re packed to the rafters with burn and free spells like Gitaxian Probe and Mutagenic Growth. In most cases, Mutagenic Growth acts as a slightly more flexible, less powerful Lava Spike. So, why aren’t we just playing Lava Spike? With Spike, all our cards are on the table when we’re attacking into potential blockers like Tarmogoyf or Kitchen Finks. Mutagenic Growth will often be two or three damage, but that time when we get to trade up (a card and a little bit less damage dealt in exchange for a premium blocker) is well worth it. Archetypes like this can play various roles, depending on post-board strategies and metagame positioning. Ancestral Vision is not off the table for sideboard options, as all that burn often gives us inevitability if we can draw enough copies of it. Bedlam Reveler seems like a synergistic inclusion, but if we’re playing that we probably have to cut either Goblin Guide or Mantis Rider. Speaking of Rider, the creature is easily the most inefficient of all of our spells. Still, all that flying and haste adds up to a lot of free damage. That has me looking at what this archetype is trying to do and leads to drawing lots of parallels to Burn. So, why aren’t we playing Burn? The answer, of course, is the playset of Spell Pierce in the board. Similar to Infect, this Jeskai Aggro list is looking to level up some pump spells with prowess, taking advantage of free spells and a hyper-efficient strategy to push our mana (and our spell quality) to the maximum. 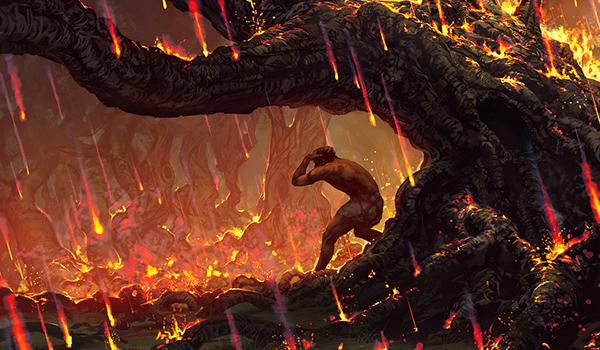 Where we benefit from the extra color is in post-board matchups against midrange strategies like Jund, and combo matchups like Tron, Ad Nauseam, and other Burn lists. If the mana is good enough, and we have a good enough plan for decks looking to race, Jeskai Aggro seems to me to be the real deal. Turning to the Classic, we see a showing from a deck that’s largely fallen off the radar. RW Prison is back, baby! I never really liked this deck the first time around, and I still think it’s a collection of poor cards supported by Nahiri, the Harbinger, which is much worse in a format that has long since shifted to adapt to her presence. Which is why we don’t see Nahiri, the Harbinger anymore. Which is why Nahiri, the Harbinger might be good again. Welcome to the brain maze. So, is Nahiri good again? The format is still full of fast, cheap creatures and combo decks, so this narrative doesn’t seem to line up. No, instead, the real answer to this archetype’s success is Anger of the Gods. Great against Infect, great against Affinity, solid against Burn, incredible against Dredge. We’ve found the secret best card in the format, and we weren’t even looking! Isn’t looking at decklists fun! If we look at some of the most popular archetypes seeing play right now, Anger of the Gods is literally the best possible thing we can be doing against them, excluding matchup-specific bombs. Stony Silence knocks out Affinity, but against a lot of boards Anger of the Gods is only slightly worse. Night of Souls’ Betrayal kills Infect, but even just getting a two-for-one in the face of protection can often stop them dead. Dredge loses their board to it. Burn, Death’s Shadow Zoo, the list goes on and on. Against some decks in the field, like Jund and Tron, Anger of the Gods isn’t really where we want to be, but the ability to play a maindeck spell that can just win games on its own in certain matchups is well worth the downside of it being dead some of the time. Jund does it with Terminate, and Terminate packs a lot less punch. It sounds like an exaggeration, but I truly believe Anger of the Gods is the best thing to be doing in Modern right now. However, it also isn’t in a color set up to take advantage of it. Sure, Lightning Bolt is and probably always will be the best card in the format—but beyond that, the rest of the color wants to be attacking and dealing damage to players, neither of which synergizes well with Anger of the Gods. The archetypes that can stretch to red to play Anger of the Gods in a reactionary role are midrange decks, which are still getting squeezed out of the metagame from every angle by all the unfair stuff left to roam free in the absence of Splinter Twin. But that’s a conversation for another day. For today, it’s time to decide. Are you going to play Anger of the Gods? Are you going to dodge it? Or are you going to beat it? First off, thanks for the great article. I personally love Anger of the Gods. I play a Mardu Midrange deck wth Anger as a playset in the main. I have found it to be one of the most useful and underrated cards in the current meta along with Thalia, Heretic Cathar. I believe that you didn’t stress how devestating this card is for Dredge. I have had several Dredge opponents scoop at a second Anger of the game. Again thanks for a great article. Maybe do an article of underrated cards? You’re right in that Anger is exquisitely positioned right now. As a Merfolk player, it’s left a mark on many of my games. It’s so good, that it’s somewhat halted the trend of midrange decks getting squeezed out of the format – take a look at MTGGoldfish’s results listing, and you’ll see Jund is a Top-3 deck, Bant Eldrazi (yes, that’s a midrange deck) is in the Top-10, and even Abzan is hanging around. Furthermore, previously ultra-fringe decks like Skred have a small, but steady presence in the metagame, and Grixis Control is also doing pretty well. Most of those decks either have Anger of the Gods, or can fight it off pretty effectively. I’ve had to make edits to my counterspell lineup as Merfolk to address the fact that it’s coming out of many sideboard nowadays. As for Sun and Moon… I think the reason it does well is that it’s basically hate card roulette. It is a collection of cards various decks really don’t want to see rolled into a single shell. If it finds the right hate cards, it stuffs you. If it doesn’t, you run it over. In a metagame that features linears with such a wide variety of angles of attack, a deck that attempts to collect all of the ways to shut them down and then staples some win conditions on the back end was a logical conclusion. I think the deck is good, and recent results bear that out. Nahiri may not be the optimal finisher all the time, but (fortunately for the deck) it has a wide variety of “end-the-game” cards to choose from, provided the hate cards buy it time to cast them. I agree Anger is pretty good positioned right now, but as a Merfolk player it’s quite easy to play around it, at least in my experience. Cursecatcher helps buying a turn, Adept cycles, it can’t get Mutavault and we have Vial end of turn. I won’t be too scared as long as not too many decks are playing it maindeck, which I belive will not happen. Yes, it’s pretty easy to play around, and it hasn’t made a notable dent in my winrate. Just another thing to expect and prepare for. So board wipes are good, so is exiling due to dredge. Am I missing something, or does that just sound like a UWx control deck running supreme verdict could fit into this particular meta? I’ve been saying that for some time now. I don’t see anything inherent in the format keeping one out other than players not finding the right shell. It can do its thing against Dredge, but it falls flat against Burn (too slow), Infect (not enough cheap spot removal, especially post-Blossoming Defense), Jund (resolved Liliana = game over), or Tron (goes way over the top). Beating the top deck doesn’t do you much good if you get smashed by the rest of the top 5. Mutagenic Growth and Gitaxian Probe both seem pretty ubiquitous right now. Upon reading the article’s title, I expected one of the two phyrexian mana spells to be the best card. Regarding the appraisal of Anderson’s Jund list: one Seal of Fire is a pretty trifling omission in an absurdly fast format where it might never show up when it is good or, worse, at a time when something better is needed. Todd also omitted Collective Brutality, which seems like a strictly better singleton, that still didn’t cut it. With all of the M.Growths being played, removal spells that can’t handle */3 creatures seem pretty bad. I’m excited to see if a grindy blue-based control deck will eventually capitalize on what’s going on.